There are projects that come once in the lifetime of an architect, even great architects – twice or thrice if one’s really lucky. One such project is the Marina Bay Sands in Singapore. 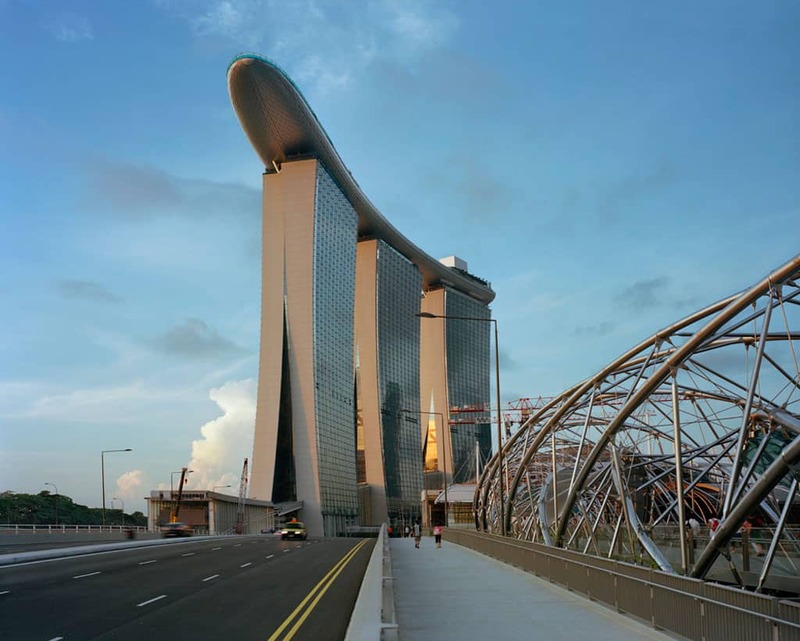 Safdie Architects was approached by the Las Vegas Sands Corporation to develop a competitive design proposal for Marina Bay to be considered by the Government of Singapore. 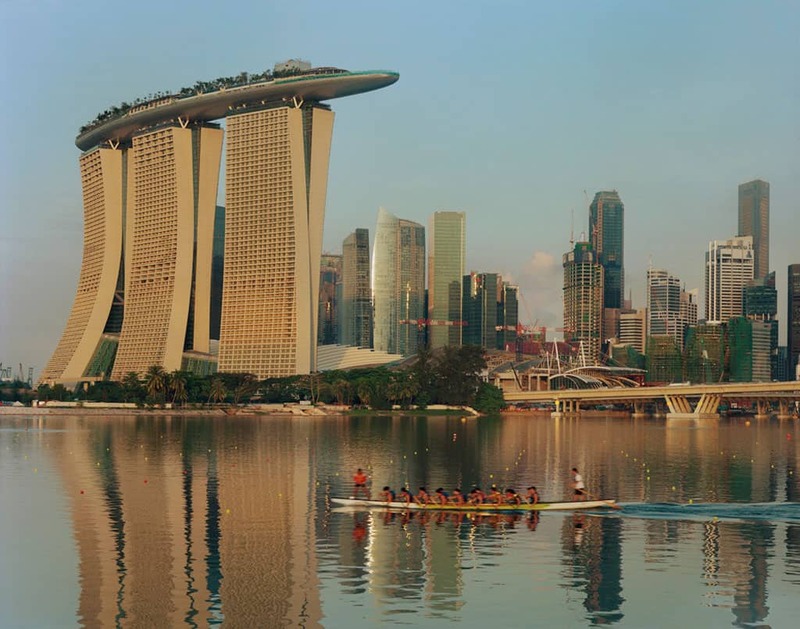 The result was more than just a building, it is what Moshe Safdie has come to refer as a microcosm of a city – a development that has grown into the cultural and contemporary lifeblood of Singapore. With a total project cost (including cost of land) of USD 5.7 billion, the Marina Bay Sands is a 845 000 square metre high density mixed used resort destination that features a 2 560 room hotel, convention centre, retail spaces, museum and a state-of-the-art casino. Set along Singapore’s Marina Bay waterfront, the resort acts as the icing of Singapore’s Central Business District – a backdrop for a dynamic and vibrant public life. Our challenge was to create a vital public place at the district-urban scale, in other words, to address the issue of megascale and invent an urban landscape that would work at the human scale. Seeing as how the sheer programmatic scale of the project would be rather complex, Moshe’s design approach was inspired by how ancient cities were organised around a major public thoroughfare. Recognising that the in-between spaces are equally, if not more important than the actual spaces in urban design; Marina Bay Sands was ordered along two principal pedestrian axes that transverse the entire district and connect to the subway and other transportation channels. For the visitor, these two circulation arteries act as a way-finding datum, seeing as most programs are arranged along them. It is here that perhaps the design ingenuity of the architect takes centre stage – how the structure is weaved with the promenade and how the two are in constant dialogue. The pedestrian streets are graced with the following spaces: the Shoppes – a multi level 74 000 square metre retail and restaurant arcade; two theatres with a combined seating capacity of 4 000; the Sands Expo and Convention Centre that features flexible convention and exhibition spaces; and a hydraulically adjustable 5 000 square metre event piazza that can host up to 10 000 guests. Floating and seemingly docked on the waterfront’s edge are two Crystal Pavilions that house shops and nightclubs. At the end of the public promenade, standing on a perpetual lily pond is the iconic ArtScience Museum. Inspired by the a lotus flower, the museum is distinctive in its design and forms a rewarding sculptural landscape element, worthy of the long walk towards it. The Las Vegas Sands Cooperation set out to make Marina Bay Sands a gambler’s dream come true and the casino remained true of this aspiration. Located in a 15 000 square metre space, the atrium-style casino features four levels of gaming and entertainment with a ceiling that holds a 7 tonne chandelier with 132 000 Swarovski crystals and 66 000 LEDs. What is seen in the Singapore’s skyline are three 55-storey towers that house a hotel and frame two grandiose window-like vistas for the Central Business District towards the waterfront. But probably the most celebrated element in the entire Marina Bay Sands is the 340 metre Sands SkyPark that delicately seats atop these three towers. An engineering marvel in its own right, the 1.2 acre SkyPark is longer that the Eiffel Tower and is tall and large enough to house four and a half A380 Airbus jumbo jets. It cantilevers 65 metres on one side and brings together gardens, jogging paths, restaurants and lounges. Running on one edge of the SkyPark is a 151 metre infinity swimming pool – the largest outdoor pool at its height. And offering sweeping panoramic views of the city is a public observatory on the cantilevered side. Borrowing a leaf from Singapore’s “Garden City” urban design concept, the SkyPark is shielded from winds with 250 trees and 650 plants. To enhance the visitor experience, Moshe Safdie selected and closely worked with five internationally acclaimed artists to create seven monumental public art installations. The Art Path features work by James Carpenter, Antony Gormley, Ned Kahn, Sol LeWitt and Chongbin Zheng; engaging the public with the blurred line between art and architecture. Where many architects would have chosen to create a single object in a project of this magnitude, Moshe Safdie successfully integrated several building typologies to create a delightful and singular experience. And whilst critics may argue that the development as a whole is busy with many design languages – I say it is successful in its own right and offers a useful case in the design of mini-cities.